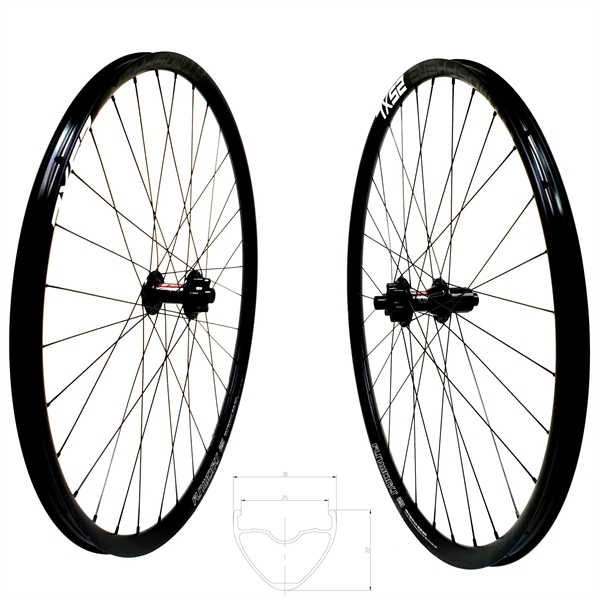 Product information "DT Swiss 370 Boost Disc IS Atmosphere 25 XL Comp Race Wheelset 650b 1670g"
Mountain Bike wheelset for Cross Country Trail use with extra large inner width. Ideal for riding with low air pressure. Reliable 3-Pawl Freehub System hubs which are perfect for top end performance all the time down the trail. The new wide for Cross Country rims is 25mm! The new Atmosphere XL rim has 5mm more Profile height than the previous model and offers perfect performance for XC and Trail bikes.The 2mm larger internal width gets more performance out of your tyres. The rim is made of high-strength New Era Alloy wich makes this rim despite the incredible low weight extremly stiff.The tubeless ready design allows an easy tubeless setup and ensures the perfect fit of the tire. Related links to "DT Swiss 370 Boost Disc IS Atmosphere 25 XL Comp Race Wheelset 650b 1670g"
Customer evaluation for "DT Swiss 370 Boost Disc IS Atmosphere 25 XL Comp Race Wheelset 650b 1670g"